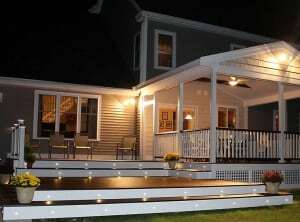 Decking & Porch Enclosures in Northern New Jersey - New Jersey Siding & Windows, Inc. Upgrading your outdoor living with a new composite deck is an easy process. Call or email us today to set up a free in-home consultation! 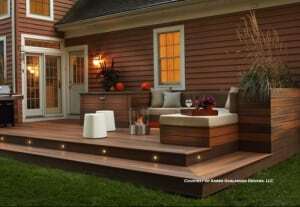 Now is the time to maximize your outdoor living with a new/redeck from New Jersey Siding & Windows. We specialize in low maintenance home remodeling products that will look beautiful on your home for a lifetime, and our decking is no different. Our focus on composite and PVC new deck construction or redecking (using your existing sub-structure, and installing new deck boards and railings) will give your family the backyard space that will last a lifetime. With names like Wolf, Azek/TimberTech, Trex, Fiberon, Zuri, or wood such as cedar or mahogany, you are guaranteed years and years of enjoyment of your deck. Our goal is to create a full extension of your interior space, adding value and functionality to your home and outdoor space. 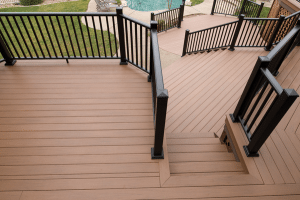 The two most popular decking materials on the current market, composite deck boards and PVC deck boards offer homeowners an array of different style options. But what is the different between the two? Composite decking has been available since the early ‘90s, but only recently has been available with a durable exterior layer of Surlyn ®. The makeup of composite decking is a high-quality, natural fiber-polymer mix, that creates a board that will not warp, crack, or swell like wood. Because it is not pure PVC, composite decking boards don’t expand and contract extensively, and allows for an easier installation, resulting in a beautiful product for the homeowner. PVC decking is the newest material used on the market. Made from 100% pure cellular PVC, manufacturers are able to offer real wood grain colors with no organic materials, ensuring that your deck will last unchanged. PVC decking takes more finesse on installation, something that non-specialists may experience difficulty with. Wolf Home Products is built on more than 170 years of experience. They are one of the largest suppliers of kitchen and bath cabinetry in the nation, as well as a leading supplier of outdoor living and building products. Their premium engineered composite and PVC decking are offered with an industry leading ASA capstock (the same material used in luxury automobile dashboards). Without the premium price tags, an unmatched manufacturer warranty, and a large selection of colors and styles, Wolf Decking can fit any home. Zuri® Premium Decking by Royal® does more than invite inspection. It necessitates it. Color and texture with minimal grain pattern repetition conspire to capture the unmistakable look of exotic timber. A hidden fastener system completes the elegant picture. Nothing can compare with the realization that you can have all of this beauty without giving a thought to all the maintenance, time investment and inconvenience that come with exotic hardwood. Zuri comes in five colors, giving homeowners five beautifully rich ways to distinguish their homes and outdoor living spaces: Chestnut, Walnut, Pecan, Brazilia, Weathered Gray. Azek offers two types of deck boards, their self-named PVC deck board, and their composite decking line, TimberTech. 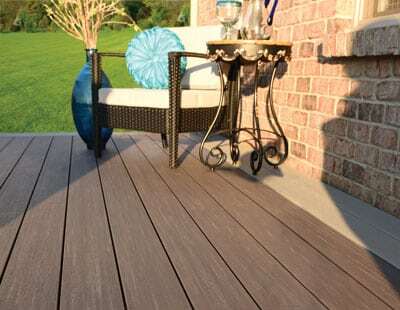 AZEK’s capped polymer decking materials are top of the line in quality and beauty. AZEK’s teams of scientists and designers have engineered high-performance decking materials that withstand the test of time and nature with unparalleled beauty. With AZEK, you’ll be able to forget the drudgery of staining your deck for protection. Made of plastic and wood fibers and coated with a composite cap, TimberTech decking is more resistant to the elements than traditional wood, and provides added durability, mold and mildew resistance, and a splinter-free surface. A practical choice for discerning homeowners, it comes in a variety of colors and grains, retaining the look and feel of traditional hardwood without the annual sealing and staining needed for protection. Synonymous with composite decking, Trex was an innovator in composite decking. 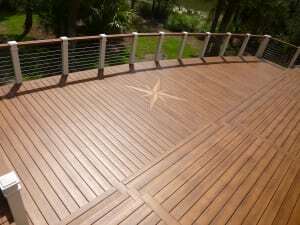 Their business was built on the invention and perfection of wood-alternative composite decking, and although they’ve expanded their outdoor offerings through the years, the enduring beauty and hassle-free maintenance of their decking and railing materials still inspires every innovation. For nearly two decades, Fiberon has been working with families like yours to create beautiful, easy-to-own outdoor spaces. Whether it is understanding the value of composites versus wood, evaluating board options, or designing a lighting scheme, Fiberon decking products can fit any style. 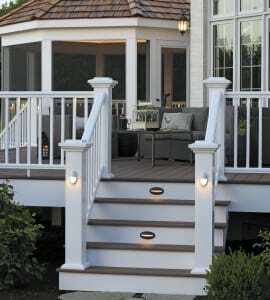 New Jersey Siding & Windows offers a large line of railing options to complete your decking project. Railings come in vinyl, composite, and aluminum styles with different baluster and color combinations to accent your deck perfectly. Want to customize your space further? 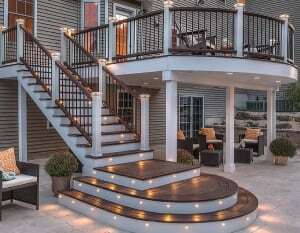 Add lighting or a drink rail to finish customize your deck completely.